The first flavors that I pick up is the teriyaki. I get a light garlic soon after, and a noticeale saltiness. The chewing brings out the soy sauce, followed by the natural meat flavors. For being marketed as, "Teriyaki", it fills bill pretty well. I get a well defined teriyaki sauce flavor, in the traditional Japanese sense. It is, however, lighter on sweet than most teriyaki sauces, and a little more pronounced in the soy sauce, but still has the fermented character and the touches of ginger. I don't, however, taste the "true Island Flavor" or the "tropical blast" that the company describes. I instead taste a traditional, teriyaki sauce. And that's pretty much the primary taste profile too. 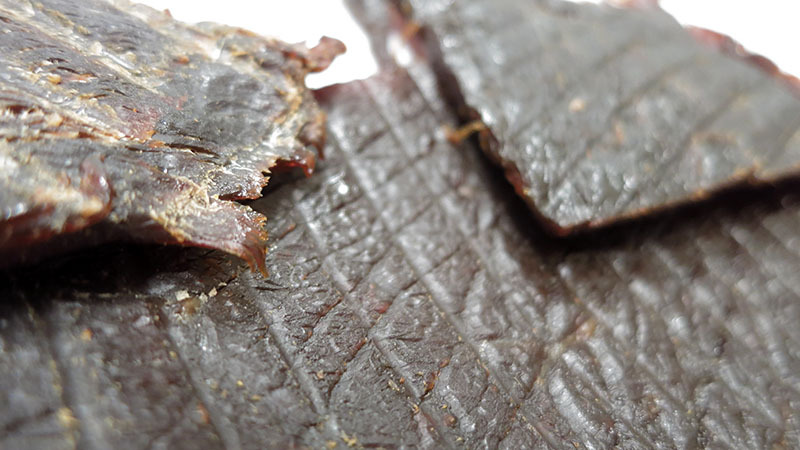 In the latter part of chewing, the sweetness wears off and leaves you mostly with soy sauce, a bit more saltiness, and the natural meat flavors. The meat consitency looks excellent. 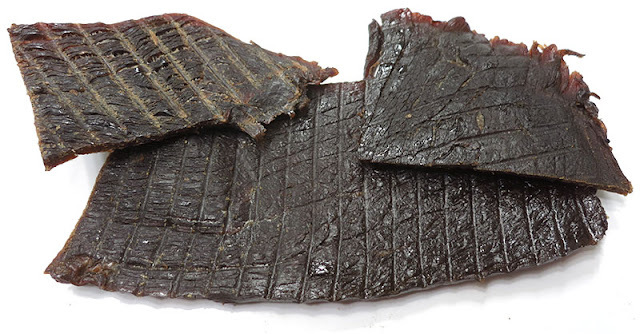 Seemingly all meat, sliced into thick slabs that easily rip apart and chew down with a fair amount of ease. It's mostly dry, but still tender, and by the time it chews down, takes on a steak-like texture. This Teriyaki Beef Jerky from Beefy Boys delivers an unmistakable teriyaki sauce flavor in the traditional, Japanese style. 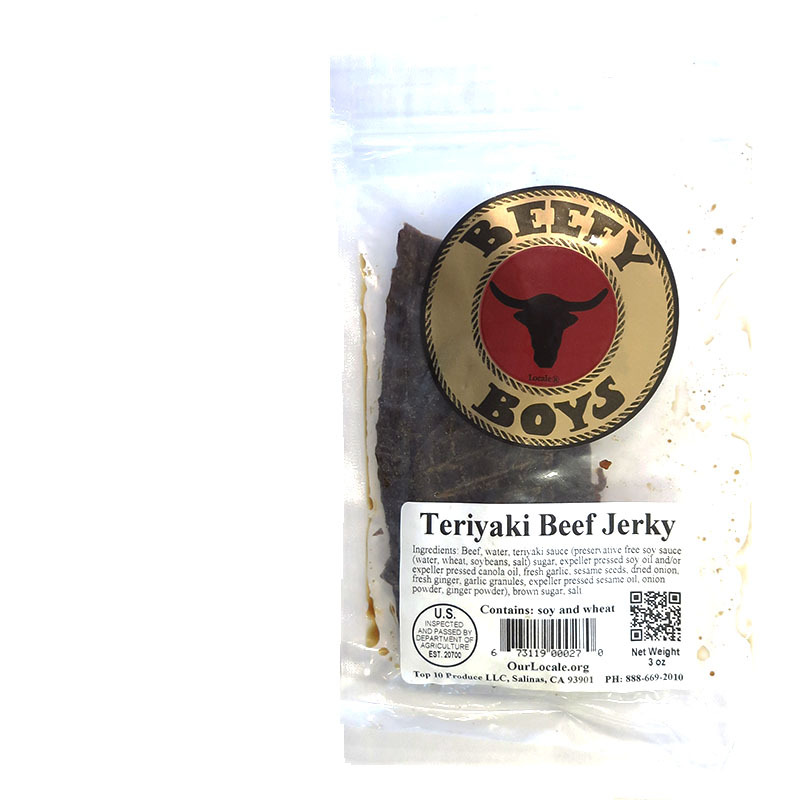 I particularly like how easy this jerky is to chew despite it being cut into thick slabs, and I like the steak-like chewing texture. Otherwise, I don't find much else in terms of flavor. It tends to be plain in that it doesn't offer much else aside from teriyaki sauce, and it tends to be on the salty side. The meat consistency and chewing texture seem to be it's strength however, and is the reason I'm rating this one-star higher than average.